The Future City Competition Regional Finals took place in Chicago on Saturday, January 19th at Whitney Young Magnet High School. The competition is the culmination of months spent by junior high school teams and their engineering mentors to create a city of the future. 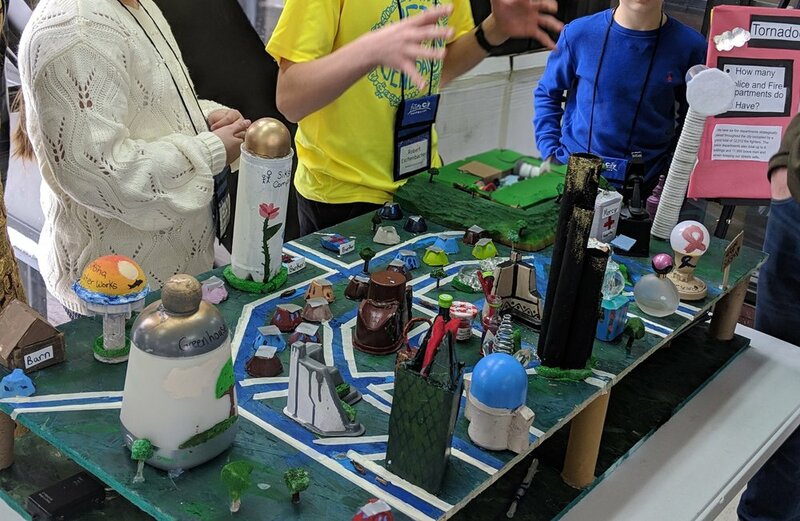 Students submit a working project plan, present their solutions via a virtual city design (using SimCity), write an essay describing the unique attributes of their city and their solution to the year’s challenge (Powering Our Future); build a scale model, and give a presentation to judges. Regional winners represent their region at the National Finals in Washington, DC. For the past five years, the Illinois Section of ITE has participated as a special award judge at the Future Cities Competition. This year, 23 different professional organizations sponsored and gave 27 special awards at the competition. Bryce Wegner, the current Section Director of Operations, and Andrew Freeman represented the Illinois Section of ITE this year as special award judges. Bryce and Andrew were tasked with reviewing each team's city and awarding the Excellence in Transportation Safety and Operations Award. This award was given to the team that had the most innovative future city design that demonstrated a safe and efficient surface transportation system that considered growth and preservation of the environment. This year, Bryce and Andrew determined that the winning city deserving of this award was Siksha, presented by students from Montini Catholic School from McHenry, Illinois. Judges were impressed with Siksha's emphasis on multiple forms of transportation systems, such as an underground maglev train for regional travel, a series of intertwined canals for clean and efficient local traffic, and an abundance of bridges and paths to accommodate pedestrians and bicyclists. Student presenters explained how each part of their transportation would compliment each other to provide a safe and efficient transportation network. The Illinois Section of ITE was happy to not only sponsor the Future City Competition in Chicago again this year, but to participate as judges. We look forward to participating in this event again next year!